It’s taken longer than I expected but FFXIV Time is finally available for the Pebble! 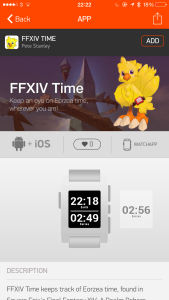 FFXIV Time is a watch app that keeps track of Eorzea time which is used in Square Enix’s successful MMORPG Final Fantasy XIV: A Realm Reborn. With Heavensward close to release there’s no better time to prepare by catching up on your mining, fishing, botany or sight-seeing log. FFXIV Time helps you keep an eye on Eorzea time, wherever you are! Big thanks to Angie for hand drawing the chocobo sporting a red Pebble running a copy of the app which is used in both the apps icon and the banner image. I’d also like to thank the following kind strangers from /r/ffxiv who helped me test the app and get it working across multiple time zones: ChaoticAgenda, OutcastKnight, tecrogue and GoldenCrater. Whilst I mull over whether to build an enhanced Pebble Time version and investigate options for alerts check out my account of why writing FFXIV Time took 1 week instead of 1 day. FFXIV Time: The 1 day Pebble app that took 1 week. You would think that writing a Pebble application to track the time in Eorzea, a region of the world found in Final Fantasy XIV, would be simple. After all displaying the time is pretty much the definition of what a watch should do. 1) The Pebble uses 32 bit integers. This means that the Pebble is susceptible to the year 2038 problem, also known as the Unix Millennium Bug. This normally wouldn’t be an issue, after all the flash storage and the battery in the Pebble will be long dead by the time we reach 2038 but it means the standard time_t C structure can’t hold FFXIV date/time values. Fortunately the localtime() function we need to format date/time strings can accept the int64_t data type so we can use that for holding Eorzea time values. 2) The Pebble maths precision returns incorrect values with large numbers. Instead of the correct Eorzea time being calculated the watch generates a number that’s 44 minutes behind the actual in-game time. Luckily this is fairly consistent so we can manually correct in code. 3) The Pebble itself has no concept of time zones. Eorzea time is based on the number of seconds since 01/01/1970, we can get that information from the Pebble but the number returned is based on the local time. Without knowing what time zone the user is in we can’t calculate Eorzea time at all. Luckily the Pebble SDK now includes the capability to run some helper code on the phone itself which means we can determine the users time zone and send that back to the watch. We can’t do this too often though as any communication with the phone is additional battery drain and we don’t want to tie the app to working only when the phone is around. 4) The time on the watch seems to drift over extended periods of time. This happens more noticibly on my 1st generation Pebble and less so on my Pebble Steel. Normally this wouldn’t matter too much, if your watch ticks over to 5pm 10 seconds faster/slower than your friends the core functionality is still good enough. Unfortunately drift of even a few seconds can have a noticeable impact on calculating Eorzea time. We can use a similar solution to the one implemented to fix problem 3 to figure out if there is a difference between the time on the phone and that of the watch and compensate accordingly. 5) Communication with the phone isn’t reliable. Problems 3 & 4 were solved by retrieving information from the phone. If we can’t communicate with the phone on first launch to get time zone information we can’t calculate Eorzea time and the app is effectively useless. During testing I found that every so often phone communication failed at app launch and with the next phone communication scheduled for an hour later (to save battery) the only way for the user to fix it was to restart the app until the communication worked. I like things that ‘just work’ so the the (heavy handed) fix I’ve implemented is to check if we have cached time zone information and if not, blast the phone with up to 30 communication calls to ensure we get something back. The feedback has been that after this routine was implemented the time self heals within seconds of the app launching without users having to do anything at all. It’s been quite a journey creating FFXIV Time (soon to be available on the Pebble Marketplace), several of the problems took longer to identify and resolve than I had initially thought the entire application would take me to write. In contrast, the proof of concept I wrote for Apple’s iWatch took only a few hours. I’m still fond of the Pebble, particularly as the iWatch doesn’t run native apps at the moment, but the difference in the time required to write the core functionality of effectively the same application is staggering. A while ago I discussed how save signing for the original Xbox works and the methodology to generate the correct key to resign a save. Save Hacking is becoming something of a legacy these days and I’m keen to do what I can to enable others to continue to work on what I guess is called ‘retro’ these days. With that in mind I’ve uploaded a quick and dirty Python script to generate Xbox save signing keys to GitHub. Tashgar is surprisingly easy to get out of and there’s a huge section of the map that you never get to see. Check out the video below to see how to get out and a couple of highlights I found. The Elgato Game Capture HD is a great bit of kit for easily and quickly capturing HD video from your console or any HDMI equipped device. One of it’s great features is the ability to Live Stream to your provider of choice, Twitch in my case, and overlay a live commentary in real time. Now a live stream without any talk gets a bit dull, especially when there’s a few of you in a group discussing and laughing about what you’re doing. Unfortunately there’s no easy way to capture the Xbox party chat. There’s a few tutorials out there which either have you push the party chat through the game audio on the Xbox whilst recording yourself separately or require you to have a specific headset and an array of different cables and adapters. Neither of these methods work great, the audio quality is often poor and in some cases you’ll find yourself manually mixing in audio tracks trying to line up your own chat recording to the game audio you recorded earlier . I’ve found a much easier way to pass a Skype chat through to the Game Capture HD software which results in much faster and convenient recording as well as vastly increased voice audio quality. Best of all, there’s no mixing audio tracks manually and it’s just about as lag free as you can get. The tutorial is based on using a Mac running OSX 10.9, although any recent Mac OS will work and uses only free software. You’ll need a gaming headset for the best results but this method can also be used with s standard headset with mic although you run the risk of game noise from your TV being heard whilst you speak which can ruin a good video. Check the video below for full instructions on getting started. I’m looking at doing an advanced follow up video for recording game audio as a separate track allowing you to stream to Twitch with a live commentary but also have local clips with just the pure game audio, keep an eye out on the Youtube Channel for it landing. I’ve been looking for some use to put my 1st gen Raspberry Pi to for some time and Shea Silverman’s work on getting a Neo Geo emulator up and running on the Pi seemed to be almost the perfect answer. Playing classics such as Soccer Brawl (possibly the first game I played on the AES) with a keyboard is OK but lets knock this up a notch; enter the Neo Geo X Arcade Stick (disclaimer: this link takes you to the purchase page for the Arcade Stick but I get no referral fees or payment). The new Neo Geo X Arcade Stick claims to be a 1:1 replica of the original with genuine arcade parts all tied together neatly with a USB connector. What better way to recreate the arcade experience at home? The Arcade Stick is automatically recognised as a joystick by the Raspberry Pi and if you’ve followed Shea’s instructions you already have a config file with joystick support enabled (top tip for the installation; if the ~/.gngeo folder doesn’t get created automatically you probably don’t have the right bios or rom set, the folder is only created after a successful launch). # enable joystick support ? There’s only one thing left to do which is update the config file with a joystick mapping, unfortunately the 2 sample configs aren’t a 1:1 match with the Arcade Stick layout so we’ll have to write our own. One thing to note is the Arcade Stick buttons C & D are presented out of order and need to be swapped accordingly in the config file. Add the config under the existing Xbox 360 and Dualshock2 samples, save the file and you’re good to go. Add Coin is mapped to Select so once you’ve loaded the emu you can select menu items with B (A is cancel), hit Select to insert a coin and relive the days when you would look on with wonder at what is possibly the most expensive gaming system to date. If you’re a PC gamer wondering if the Neo Geo X Arcade Stick works on your platform of choice I can confirm that I have had it successfully running with FBA with only the joystick mapping needing to be changed. But lets face it, running Neo Geo games on a £500+ PC isn’t as cool as running it on one that costs £35. This article covers the saves signing process used by the original Xbox. Only the standard signing process is discussed, the “noroam” signatures are not covered. All code is based on my own work or derivative work of others. The language used in examples is Delphi and assumes a familiarity with programming concepts such as the use of records or structures for reading in data. The reason I’ve never previously discussed the Xbox save signing procedure in public is concern that by doing so would negatively impact Xbox Live. Now that the original Xbox and it’s games are unable to access the Xbox Live service the following information is relatively harmless. The original Xbox used digital signatures to validate not only executables it was loading but save data, with this it was impossible to change or tamper with a save without updating the file’s digital signature using the correct key. This key was generated using data contained within the default.xbe and a key used by the Xbox Operating System. The save data was then run through a SHA1 HMAC routine and the 20 byte result appended to the save data to confirm integrity. This result, or digest, was usually found at the beginning or the end of a file although it can potentially be located anywhere in the file if the developer was feeling adventurous. Each Xbox game has a default.xbe file, this is the executable that is loaded whenever you start a game. It contains various information including the title ID, age rating, game region and the all important signature key. Don’t get confused, this is not the key used to sign the saves but is an essential piece in the process. The TxbeHeader record contains a lot of data but the two most important sections are m_certificate_addr, and m_base. These two values give us the address of the certificate. The key we retrieved from the XBE is not used to directly sign save data, instead it is used in a SHA1 HMAC with the Xbox key to produce the actual key we need. Thankfully we don’t need to determine the Xbox key every time we need to sign or verify a save as it is a constant. Once you have this key in a byte array simply run both the XBE key and the Xbox key through a SHA1 HMAC (referring to the documentation for your SHA1 HMAC function as to whether you need to pass data or memory addresses to the function). The output should be a 160bit digest truncated to 16 bytes (the last 4 bytes are not required and should not be used or present). As noted before the digital signature is usually found before or after the actual save data. It is entirely possible to store this signature at any location in the file and treat this location as all 0’s during the HMAC process. Since we cannot rely on all developers using the same location for the signature we must determine the location ourselves. The fastest and easiest way to do this is to start a new game and make a save at the earliest opportunity. If the game saves any options you change this is ideal, otherwise start playing and save as soon as you can. Copy this save to you PC and label is SAVE A. Load the game again and create another save with as small a difference as you can but ensuring something is different. As before, if the game saves option changes you should change only a single item and re-save. 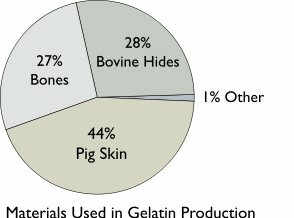 Copy this save to your PC and label it SAVE B. Open both saves in a hex editor and visually compare the two, with little differences between them you should easily spot the 20 byte digital signature either at the start or the end of the file. You can use an automatic file comparison if your editor supports it but in my experience I can find the sig faster by eye. The signature in both files should be wildly different with the actual save data very consistent, aside from the minor differences you saved earlier. Once you have found the sig location you should exclude this from the HMAC routines. If the sig is at the end of the file you should HMAC all data up to the last 20 bytes, if it is at the beginning then all data after the first 20 bytes should be processed. If the signature is located at another location in the file then you will need to experiment as to what data to HMAC. A common trick when generating checksum’s is to treat the area containing the result of the checksum as all 0’s during the processing stage and write the result back to this location once complete. Please note, it is rare to see this, most saves store their signature at the beginning or end of the file. Now you have the correct key and the data to process you can generate or check signatures for that particular games save files. Similar to how the key was generated, the actual signature generation is a SHA1 HMAC of the save data (excluding the existing signature) with the key. Before making any changes to a save you should confirm that the signature you generate matches that already present on an unaltered save. It’s worth bearing in mind that a lot of saves contain a checksum as well as a digital signature. The most common being a CRC32 or a simple addition of bytes, you must recalculate this before the digital signature should you make any changes to the file. Compare resulting 160 bit digest to existing signature or write back to save file. If you use the information above to create anything or produce a unique save, drop me a line in the comments, sometimes the most interesting time in a games life is long after it was released..
I’m a big fan of the community features introduced in Halo 3 and always check out the latest screen shots and videos whilst waiting for a game to start. When Halo Waypoint was released I was pleased to see a regular feature on community videos and it became a regular feature for my Wednesdays. If, like me, you were disappointed when season 1 ended you’ll be glad to hear that it’s made it’s return today with a top 5 entitled “Welcome Aboard” focusing on the art of boarding. The video at number 2 might look a little familiar to those that were reading (and watching) my exploits back in June 2009…. I’ve been implementing the WordPress e-Commerce plug-in on another site, it’s not a bad freebie but if you’re selling anything more than a handful of items then you’ll need to let your users search your products. To add this functionality, along with a few other features, you need to purchase the $50 Gold Cart add-in. Notice the change in the table being searched. The original code I found still looked in the WPSC_TABLE_PRODUCT_CATEGORIES table but this does not contain the additional_description field, an oversight on the original modders part. WP e-Commerce is a lot of work, especially considering you have to pay $50 just to get basic functionality and then hack in the desired features. Lets hope the checkout refresh bug doesn’t hit again….